Jean McQuillin, R.N., is a registered nurse with a background in pediatric nursing. She is also a consultant for nutraMetrix, a company that offers a comprehensive range of customized products and services to support health care professionals whose clients want to improve their own health or that of their families. nutraMetrix is a division of Market America, a product brokerage company. According to McQuillin, "We work with health care professionals to help them integrate wellness solutions into their practices. But often healthcare professionals don't have the time or sometimes even the information to provide wellness solutions. We provide a turnkey system including a nutraMetrix consultant to allow health care professionals to respond to their patient's questions about wellness without taking time away from the services already offered by the practice. Our clients include physicians, dentists, chiropractors, podiatrists and other healthcare professionals." McQuillin has a passion for wellness and good self-care. She believes that those concepts also apply to children, including children with special needs, such as those with autism spectrum disorder and cerebral palsy. Her company offers products that are safe and effective for children, and many parents report that these products have made a difference for their children. 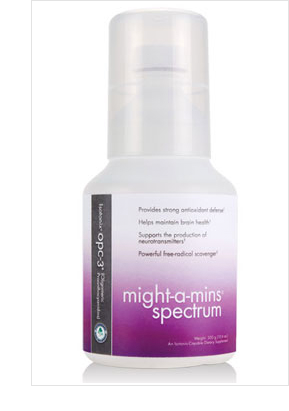 "'Might-a-Mins Spectrum' products are formulated for children who need metabolic and neurological support, with appropriate ingredients and dosages for children. They are specifically intended for special needs children, such as those on the autism spectrum, who often have gastrointestinal symptoms such as diarrhea, constipation, nausea and stomach pain," McQuillin says. "Sometimes, their bodies absorb nutrients poorly, or they may have difficulties with eating. Our supplements are designed for efficient absorption; 95% of the product can be absorbed in five minutes. That's the next best thing to intravenous delivery." There are five products in the Might-a-Mins Spectrum" line, including "Might-a-Mins Spectrum Isotonix OPC3", which assists in providing antioxidant defense, maintaining brain health, and supporting the production of neurotransmitters; Might-a-Mins Spectrum Isotonix Digestive Enzymes, which promotes stomach comfort and bowel regularity in children by enhancing enzymatic breakdown of food so it can be more easily absorbed; Might-a-Mins Spectrum Isotonix Multivitamin, to provide a strong micronutrient foundation; Might-a-Mins Spectrum Probiotics (in chewable form), five carefully selected bacterial strains – four lactobacilli strains and one streptococcus strain – each with a role to help support children's health, to help restore the normal gastrointestinal bacteria; and Might-a-Mins Spectrum Essential Omega 3 (in liquid form) to support brain health and immune function. One mother, whose 4 1/2 year old son is autistic, has been giving Spectrum isotonix to her son. "Two months of Spectrum supplements cleared up the rash he has had all his life. His eye contact has improved. I am getting positive letters from his teacher on a regular basis. Most importantly, he is connecting and communicating more with people. I believe that the Spectrum supplements are playing a crucial role in his progress." To contact Jean McQuillin, call (412) 759-4199 or send email to jeaniemcquillin@yahoo.com. For more information, visit www.nutraMetrix.com.